After a long off season, the first Sprintcar race of the 2018/19 Murray Machining and Sheds Speedway season will take place this Saturday night with the Annual Bill Wigzell Battle of the Bridge. For several years now the “Wigzell Race”, that honours former Australian and Classic Champion Bill Wigzell OAM, has become the traditional South Australian Sprintcar season opener and this year it will double as Round 1 of the Shadetec Ultimate Sprintcar Championship SA. The 21-car field that has nominated for the October 13 event includes 9 of the top 10 drivers from last season’s overall USC SA points chase with Robbie Farr back to defend his Series Championship while local Murray Bridge racer Ryan Jones will attempt to repeat his “Wigzell” win from 12 months ago. But they won’t be the only two drivers worth keeping an eye on as the nomination list includes many of the best drivers South Australia has to offer. Two seasons back Luke Dillon won this race on his way to a USC SA Championship while drivers such as former State Champions Matt Egel and Brad Keller, Brock Hallett, Keke Falland, Daniel Pestka and Steven Caruso would love to add this prestigious race to their resumes. For many the fan favourite on Saturday night will Todd Wigzell, Bill’s Grandson, who will perform double duty racing both Sprintcars and Speedcars, two classes that Bill raced with great success during his days behind the wheel. In addition to Robbie Farr the field will also include a couple of interstate drivers with current Northern Territory State Champion Chace Karpenko making the long trip from Darwin while Victorian Jake Smith will also be a welcomed addition. Karpenko could be a real dark horse for this race having won four feature races at the Northline Speedway (Darwin) during the southern off season along with a further two podium results in Darwin and another at Arunga Park in Alice Springs. The second meeting of the year will also feature a huge support program with the open wheeled action set to continue with the Speedcars and V6 Sprints with the Super and Junior Sedans rounding out the action-packed evening. The small field of Speedcars includes several Victorian visitors with Harley Bishop and Chris Nankiville travelling across the border to take on the likes of Todd Wigzell and Robert Heard while Nick Hall and Melissa Crouch, who will be making a return to racing after a five-year absence, are likely to be the front runners in the opening appearance of the V6 Sprints for the new season. After some competitive racing a fortnight ago, the Super Sedans are back with opening night winner Ryan Alexander looking to go back to back, but he will be kept honest by local Paul Blenkiron, who missed the opening night, last start runner-up Kym Jury, Jason Gantz and Steve Schwartz. Finally, the Junior Sedans will be out in force with the field almost doubling from last meeting with therefore last start winner Kirra-Lee Pitcher may find the competition a little tougher this Saturday night as the field includes Nathan and Heath Thorne, Drew Flatman, Sharni Pitcher and the Richter Boys Corey and Max. 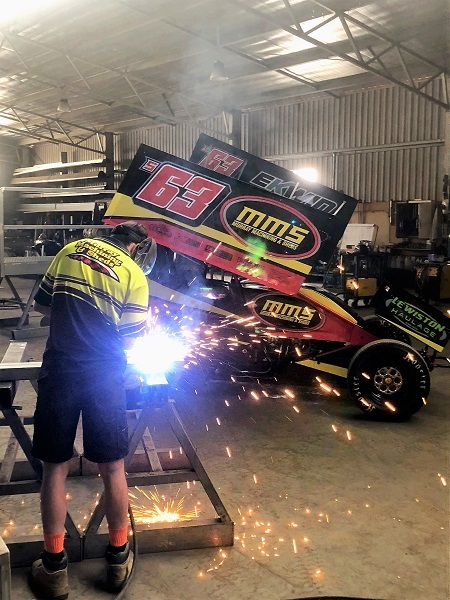 Murray Machining and Sheds Murray Bridge Speedway – October 13, 2018. Bill Wigzell Battle of the Bridge – Shadetec Ultimate Sprintcar Championship SA Round 1, Speedcars, Super Sedans, V6 Sprints, Junior Sedans. Gates open at 3pm with racing from 5pm. Admission – Adults $30.00, Concession $25.00, Juniors (13 to 15 years) $15.00 with $70.00 (2 Adults, 2 Juniors) per Family. Murray Bridge Speedway – It’s YOUR Speedway SA! !